Magikarp & Wailord GX (SM166) makes its debut as the first Tag Team card in the Pokemon Trading Card Game. The much anticipated, uber powerful new mechanic begins with the highest HP of any Pokemon in the history of the game. M&W’s massive 300 HP is the most amount of HP on any Pokemon we’ve ever seen. And we have multiple Tools that will potentially boost it up even higher than that. With the attacks that it has, though, M&W’s unbelievably high HP will probably be its greatest asset. You have to get five Water energy on it to do 180 damage with Super Splash. To use the GX move Towering Splash, you have to have eight Water energy. Towering Splash does only ten damage to the active… but does spread 100 damage to each benched Pokemon. However, considering you’re putting on all of this energy onto one Pokemon, you won’t be able to heal it with Max Potion or pick it up with Acerola or Super Scoop Up. But it is weak to the most common type you’ll find on the ladder right now, so maybe trying to use it as a wall isn’t the best idea anyway. The one time I have faced it was in a tournament match on PTCGO. My opponent was doing an excellent job of building up his hand size while still managing to recycle Acerolas. I’m sure it had to be an Unown Hand deck, but when he got up close to the thirty card range, he conceded. I’m not sure if he realized his Unown was prized or what because I figured it was going to be a certain loss for me (I was playing my Buzzwole Shedinja deck … a HORRIBLE match up for me, I basically had to six shot him). I’ve mentioned it a number of times: I think these Tag Team Pokemon are going to be big disappointments. I’ve been playing a lot with Blissey LOT and Chandelure LOT, and I consistently hit 320 or well above that. There are quite a few single prize Pokemon that are going to two shot these Tag Teams at worst, and – with Shrine and Choice Band – maybe even take them down in one hit. And what people aren’t realizing is that when one of your Tag Team Pokemon gets KO’d, you’re essentially giving your opponent three additional cards. It’s not bad enough that you just gave up half of your prizes, you’re also giving your opponent a three card bonus. Sure you still want to play a three prize card that gets OHKO’d by baby Buzz or Sceptile CES? And maybe I’m wrong. Maybe these Tag Team Pokemon will dominate the meta. Two years ago when the GX’s first dropped, they saw very little play initially. Then people realized how good they were and quickly adopted them. I see this as a completely different situation, however. They were designed to be dominant, meta changing cards that would rule the game; instead, I think many of us are recognizing them as huge liabilities that will probably make it much easier for your opponent to beat you. Note: Some of my reviews this week went up late, so even if there was nothing there the last time you looked, there should be now. Today’s Throwback… isn’t. I had a total memory fail and almost forgot to review the new Magikarp & Wailord-GX (SM – Black Star Promos SM166). Making this extra bad, this card has ALREADY seen some competitive success, managing a 5th place finish in the Masters Division of the recent Regional Championship held in Dallas, TX! Please NOTE that this was an Expanded Format tournament; I’ll review things both in terms of how it performed there and how I think it’ll do elsewhere in both formats. I WILL be considering cards from SM – Team Up already; the set officially releases TOMORROW, and even legality for competitive play will only be two weeks away by then. Magikarp & Wailord-GX is one of the new TAG TEAM Pokémon. Yes, the official article insists on capitalizing it, which means I will too (at least for now). I wrote my own article that will tackle what it means to be a TAG TEAM Pokémon in a little more depth, but the SHORT version is these are a subclass of Pokémon-GX, based on two Pokémon which share at least one Type, always a Basic regardless of the featured Pokémon, with even greater HP and what are at least intended to be even better effect than a GX-card that features either of them separately… but are worth THREE PRIZES when KO’d! Yeah, they’d better be pretty amazing if they’re worth half your beginning Prizes. Magikarp & Wailord-GX is a [W] Type, handy if you’re using it with cards like Brooklet Hill or Aqua Patch but that was NOT how it was used in Texas. If you’re attacking with it, you’ll have some Weakness to exploit but all the examples I’m seeing don’t have the right HP scores for it to matter. [W] Resistance and anti-[W] effects still exist in Expanded, but the only one you’re likely to encounter is Parallel City; you’ll have to slap a -20 penalty on your own attacks if you want to use Parallel City to shrink your opponent’s Bench. Being a Basic is great; minimum deck space, easy to field, etc. The first advantage of being a TAG TEAM Pokémon finally manifests; Magikarp & Wailord-GX set a new record for max printed HP with its score of 300! OHKO’s are going to be highly unlikely unless the attacker matches your Weakness. Even what would otherwise be “OHKO decks” are going to struggle, though even 300 is far from immortal. Speaking of Weakness, for Magikarp & Wailord-GX it is [G]; far from the worst but enough that even that 300 HP is probably going down from just one serious attack. Even the normally lackluster -20 damage provided against a single Type from Resistance would be formidable with 300 HP behind it. Probably TOO good, so I’m not mad that R&D gave Magikarp & Wailord-GX NONE. I’m also glad they didn’t give it a new, record-setting Retreat Cost either and yes, that has happened in the past! Anymore, [CC] is enough you’ve got to pack alternatives to manually retreating at full price, and [CCCC] is worse EXCEPT it gives you access to some useful tricks, like Heavy Ball or the soon-to-officially-release Buff Padding (SM – Team Up 136/181). Magikarp & Wailord-GX have just one regular attack and their GX-attack. The first is “Super Splash” and it requires [WWWWW] to do 180 damage. You’re averaging 36 damage per Energy, and needing five Energy often requires abundant Energy acceleration when the requirements are all [C]. You’ll need something that can attach many [W] Energy quickly to Magikarp & Wailord-GX because this card can’t do much with less Energy. The GX-attack, Towering Splash-GX can be used for just [W] BUT if you do, it only does 10 damage. If you can attach an ADDITIONAL seven extra [W] Energy, though, then Towering Splash-GX does 10 damage PLUS 100 damage to each of your opponent’s Benched Pokémon. Only doing 10 to the Active EVEN after paying the extra is disappointing, but like the lack of Resistance, it also is likely justified because 100 damage to each of your opponent’s Benched Pokémon is pretty insane. Unless your opponent has few to no Pokémon on their Bench, of course. This tells us either we’re running Magikarp & Wailord-GX with massive amounts of [W] Energy and the Energy acceleration to go with it, or we’re running it with almost none because we’re ONLY using it as a meatshield. The Dallas, TX Regional Championship has 802 competitors in the Masters Division, so making the Top 80 meant you finished in the top 10%. We saw three decks use Magikarp & Wailord-GX as non-attackers, just for their HP. Two were enjoying Unown (SM – Lost Thunder 90/214) before its banning goes into effect on February 15th. One was just your typical stall/mill. These were NOT among the higher placing examples. Instead, the other NINETEEN decks running Magikarp & Wailord-GX using decks were backing it with good ol’ Blastoise (BW – Boundaries Cross 31/149; BW – Plasma Storm 137/135; BW – Plasma Blast 16/101), put into by Archie’s Ace in the Hole. Deluge makes Super Slash practical and keeps Towering Splash-GX from being ridiculously difficult; still not easy, though, as most of these decks don’t have room for 10-11 basic Water Energy cards. Right now, we don’t have a good partner for Magikarp & Wailord-GX in the Standard Format, at least as attackers. Some builds even were able to include an Acerola, so that anything less than a OHKO wasn’t taking out Magikarp & Wailord-GX. Blastoise or other supporting Pokémon were still vulnerable, but the decks had a few other attacks in case Magikarp & Wailord-GX weren’t going to have the time to just OHKO three of your opponent’s basic Pokémon-GX or score a massive multi-OHKO by wiping out your opponent’s Bench. The decks ran counters for the most common forms of Bench protection, as well as a copy of Giratina (SM – Lost Thunder 94/214; SM – Black Star Promos SM151) to bring well-known Bench-sitters like Shaymin-EX (XY – Roaring Skies 77/108, 77a/108, 106/108) or Naganadel into OHKO range of the Bench damage from Towering Splash-GX. None of that is an option in the Standard Format. You still have stall decks that could run Magikarp & Wailord-GX as just a wall to toss up and soak hits, before cards like Acerola bounced it back into your hand to effectively heal all its damage. You MIGHT be able to manage with Aqua Patch, Naganadel, and Quagsire (Dragon Majesty 26/70), but that is a lot of vulnerable Bench-sitters; the popular single-Prize attacker decks probably just force Wailord-GX to the Bench and take a OHKO against anything else. Pretty much any deck can try that against anything running Magikarp & Wailord-GX, but stall decks and Archie’s Blastoise decks are less likely to have something vulnerable on the Bench, and forcing a Blastoise into the Active slot for the OHKO is just a tad trickier than the others due to its HP and fact your opponent might be able to drop another into play without missing a beat thanks to Archie’s Ace in the Hole. You might have a Standard-legal option soon, though” Blastoise (SM – Team Up 25/181) has the Ability “Squall”; once per turn, you reveal the top six cards of your deck and can attach any [W] Energy you find there to your Pokémon. While you won’t have Archie’s Ace in the Hole to speed THIS Blastoise into play, it also sports a solid 160 HP, 20 more than the iconic Blastoise with Deluge. As a promo, Magikarp & Wailord-GX isn’t something you can use in the Limited Format… except it was reprinted as a Rainbow Rare and Secret Rare in SM – Team Up. If you pull enough [W] compatible stuff to go with it, then it could make for a devastating finisher… but there is quite a bit of danger in it being stranded up front, which means a +39 build is bad as well. 300 HP should last many, many turns but sans Energy acceleration, Magikarp & Wailord-GX needs five turns to attack. It won’t be able to easily shake things Special Conditions, either. Magikarp & Wailord-GX score so well in Expanded because, not only have we seen they can indeed work as predicted, but we’re looking at stall decks and as an attacker for Archie’s Blastoise. Even with alternatives to it for both decks, its enough to make it a fantastic card! If the new Blastoise doesn’t work well with Magikarp & Wailord-GX, then I’ve scored it a bit too high for Standard Format play, but it should still be a decent enough wall outside of certain bad matchups. 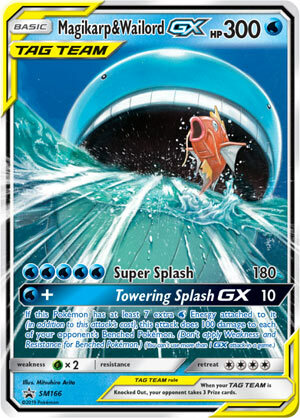 Magikarp & Wailord GX was the first Tag Team GX that we get via Towering Splash GX box. You can read my first thoughts here. I don’t think I would think differently than what I already said two months ago. One thing I might add, however, is that it has received a Full Art and a Secret Rare print from the SM Team Up expansion. I don’t think it’ll do well there, because of how hard it is to pull one. And even if you do pull one, I don’t think it has enough time to afford five turns of manual energy attachments, even with that 300 HP.